Baltimore Album Quilt, unknown maker, c 1850, 86in x 84in. Daughters of the American Revolution Museum, Washington DC, Permanent Collection (98.31). Blooms, birds, buildings and elaborately woven baskets declare the place of origin of this spectacular textile: Baltimore. Located in the state of Maryland on the eastern seaboard of the United States, this port city was the birthplace of a genre of needle art that remains the epitome of appliqué skill. The beginnings of album quilts can be traced to the fad for creating books of collected signatures, drawings and names that transmuted into fabric (alluded to in this quilt by the block depicting a bird carrying a more traditional album), but how, why and by whom the effusive, multilayered designs were created remains a mystery. 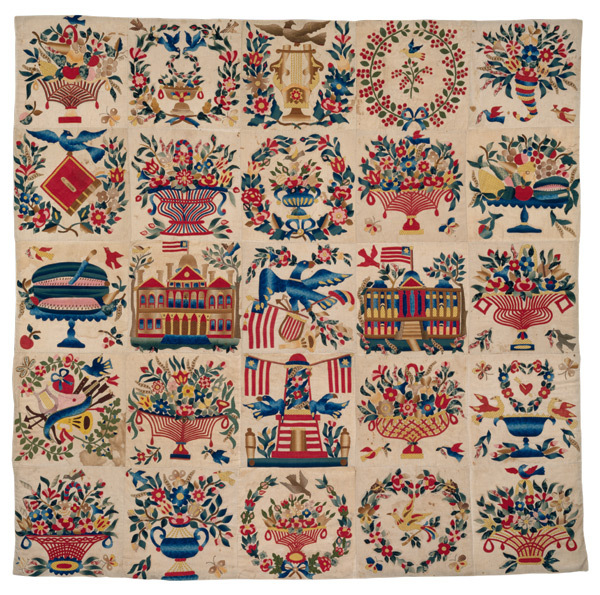 Adding to the conundrum, Baltimore album quilts appear full blown in the late 1840s, but disappear (except in the hearts and by the needles of imitators) in a little over a decade. Similar and often identical block designs, frequently in identical fabrics, indicate the designs were being commercially created and distributed, but documentation remains elusive. We can ‘read’ the designs in this unquilted backed top to know more about its pedigree. The block in the very centre is an eagle with talons full of a simplified American flag plus arrows, olive branches, a shield and a Liberty cap. Based on the Great Seal of the United States, it symbolically depicts the various aspects of government and the ideals of a democratic nation. Directly below the eagle is an artistic depiction of Baltimore’s Battle Monument. Erected to commemorate the Battle of Baltimore (the battle against the British that inspired Francis Scott Key to write the poem that would become the US National Anthem, ‘The Star Spangled Banner’), this monument has the names of all the American soldiers who died in the engagement inscribed on carved stone garlands that crisscross the tower. There are 18 layers to the base of the actual monument representing the 18 states that then existed, but not all could be comfortably depicted in the quilt block. Griffins (mythical beasts with the head and wings of an eagle and the body of a lion) guard the four corners of the monument. These beasts get interpreted differently (and sometimes quite oddly) on various known quilts. The maker of this quilt, with an obvious flair for birds as seen in the other blocks, preferred full eagles to hybrids. Imagination also overcame reality with the addition of flowers and flags. Flanking the eagle are two imposing buildings: the United States Capitol building (prior to the changes made to the dome in the 1850s), and Baltimore’s Merchants Exchange building (a multi-use public building similar to a modern convention centre, no longer existing). The centre row begins with yet another symbol of Baltimore, the watermelon. Grown profusely in surrounding farmland, melons arrived at Baltimore’s docks in large numbers during the summer months. Eagerly awaited as a cooling treat in a hot climate (in a time before air conditioning), discussed in local newspapers, and decried as a nuisance by the harbour master because rotten specimens were often thrown in the water, the fruit remained a symbol of the city well into the 20th century. Improvements in local infrastructure made transportation by road more profitable than by water and the melon boats receded. More mystery surrounds the previous ownership of this top. Unlike most album quilts, there are no signatures on the blocks. Found in a Connecticut attic after the sisters who had lived in the house had died, how it travelled several hundred miles north and who made it are unknown. Because a contemporary diary reference mentions a “Mrs Mary Simon” who “cut and basted” block designs similar to those in this top, it is referred to as a ‘Mary Simon Style’ Baltimore album. When compared with other quilts of similar designs, this top seems almost a ‘catalogue’ of what could be chosen. For example, other eagle blocks may drop one or more of the elements that fill the block on this top, or another quilt may have fewer musical instruments depicted in a single block than seen here. Confident masters of appliqué can purchase patterns of this top (line drawings only, no detailed instructions) from the DAR Museum and make their own design choices.